Oopphhhh...I've been down for the count the last few days. Writing, blogging and the accompanying stuff that precedes and follows up were simply beyond my capabilities this week. Oh, what I would have given for a great big bowl of homemade chicken noodle soup! Alas, even soup making was too much...just think, it would have humidified the whole house with that beautiful chicken-y perfume! Such a practical comfort food! When you're under the weather, do you imagine Mom's chicken soup? My mom's chicken noodle soup came out of the Campbell's can! I wouldn't have minded opening a can, but this darn gluten issue prevented that. Comfort food might have been just what my heart was craving, but the body simply couldn't manage it. And so my brain started working down it's mental list of alternate comfort foods that weren't a pain to make. As I thought, I kept returning to the recent Food with Friends weekend in Annapolis, remembering good times and all the good food...and I kept going back to Marti's Shaved Fennel with Parm. That would be so good again. It would comfort me, take my tastebuds, at least, back to a little reality of the sweet memory. Not only that, I had fennel AND parm and it was a snap to make. Hence, a brand new dish was added to my lexicon of personal comfort foods. Chicken soup begone! There's a new comfort food in town! Scatter the fennel evenly over the bottom of a shallow baking dish. Squeeze the lemon half over the top, distribute the minced garlic evenly over the top. Using a veggie peeler or microplane, generously shave the parm over the top in curls. The amount in the recipe above is a suggestion, not a rule...splurge! Place into a preheated 375 degree oven and bake 30 to 45 minutes or until tender and beautifully browned. Garnish with a few reserved fennel fronds. NOTE: Save those fronds to make a simple syrup for cocktails or to add into a salad. Both are wonderful. NOTE 2: This is my interpretation of Marti's dish...hope I've done it justice, Marti! 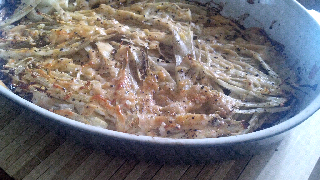 Marti's Parm-crusted fennel "before" (in the foreground), my version "after" above.